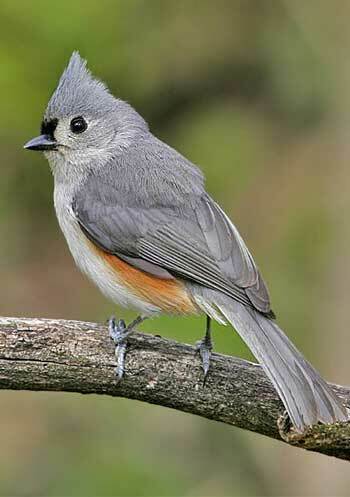 The Tufted Titmouse is one of the most common backyard feeder birds in New Hanover and surrounding counties. They are quite vocal and active so are easy to spot, similar to the Carolina Chickadee. This species is non migratory, so you can see them year round. Males and females have similar coloration: medium gray above, white belly and throat, orangey patches along the sides, and a small black patch above the beak. The beak and legs are black. In the wild, Tufted Titmice are commonly found in mature deciduous forests. They feed on insects and seeds. They are a cavity nesting species, so in your backyard they may use bird houses you put up. If you would like to attract this species to your backyard, try using a bird seed blend with peanuts (shell free) and sunflower. This is also a bird commonly seen eating suet. At Wild Bird & Garden, we stock a variety of seed blends with peanuts and sunflower as well as suet cakes. Also check out our variety of bird houses, all of which might attract Tufted Titmice. 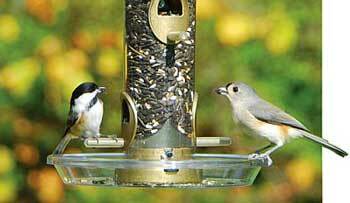 Tufted Titmouse (right) and it's close cousin the Carolina Chickadee (left) eat from a feeder.